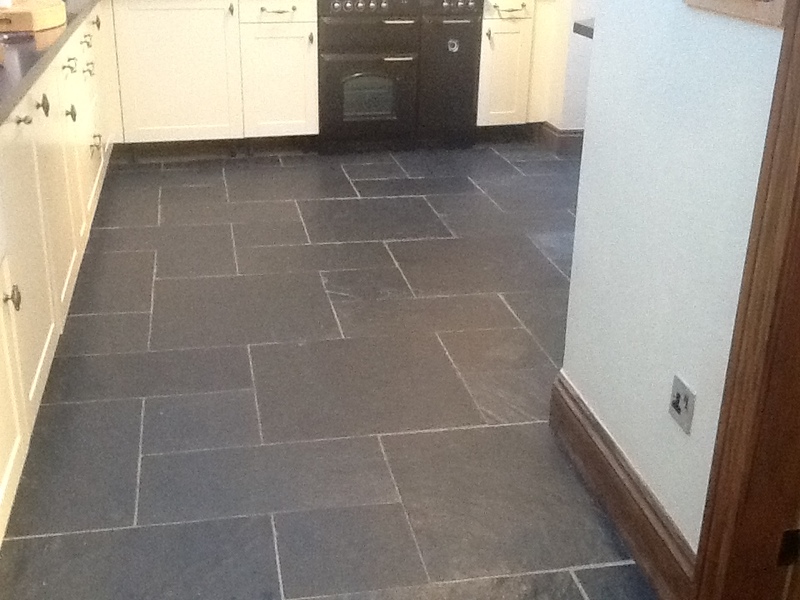 The photographs below are taken from a job in the village of Whilton near Daventry where we were asked to clean and seal a black Welsh Slate tiled floor that was installed in a Kitchen and adjacent dining area. 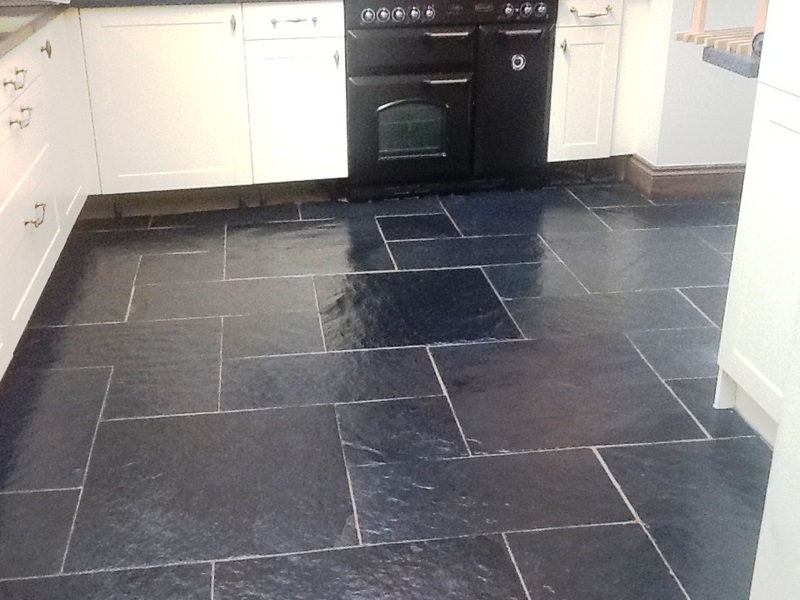 The customer was concerned that the floor was very dull and proving difficult to keep clean additionally she was having a new kitchen fitted and didn’t want to replace the floor but wanted to achieve a shiny finish that was easy to maintain. 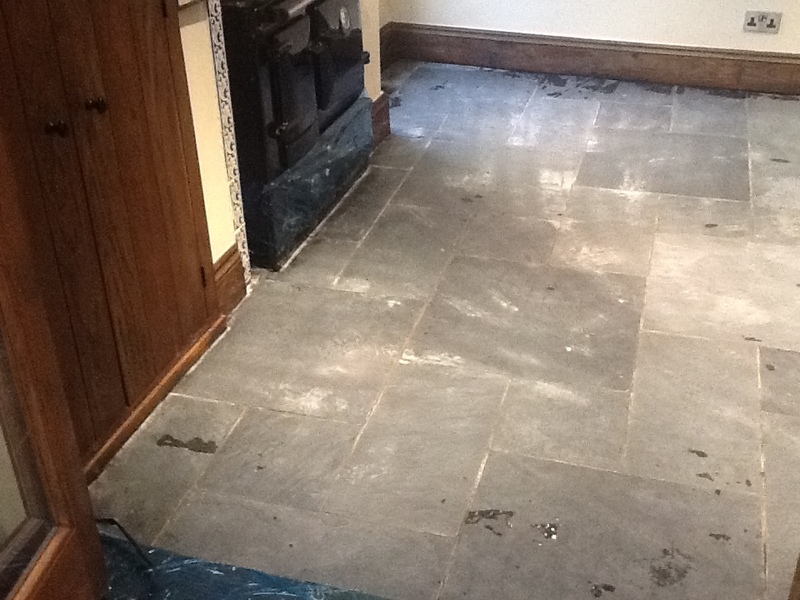 On the initial survey I found the sealant was of a poor quality and had all but worn off allowing stain and soil to seep into the grout and stain the tiles, stains which were difficult to remove with normal household cleaning products. After fully masking up the areas to protect the skirting boards and wooden steps I carried out a deep clean with a dilution of Tile Doctor Remove and Go worked in with a rotary machine fitted with a black scrubbing pad in order to strip the floor and remove the old wax sealer and tackle the ingrained stains and grime. Additionally the grout lines were scrubbed using stiff hand brushes to bring them back to an acceptable appearance. The soiled cleaning solution was removed using a wet vacuum and then washed down with clean water so we could see the areas that needed further work and repeated the process. Once I was happy with the overall appearance the entire area was given a thorough rinse and wash to remove any chemical and neutralise the floor before sealing. We left a dehumidifier in place to assist in the drying process as we wanted to ensure the tile and grout was fully dry prior to application of a sealer. We came back two days later and checked the floor was dry which it was so we proceeded to apply the sealer for which we chose Tile Doctor Seal and Go which is a water based sealer (no smell) that is recommended for Slate tiles and provides good stain protection with a low sheen finish that really does bring the floor alive. 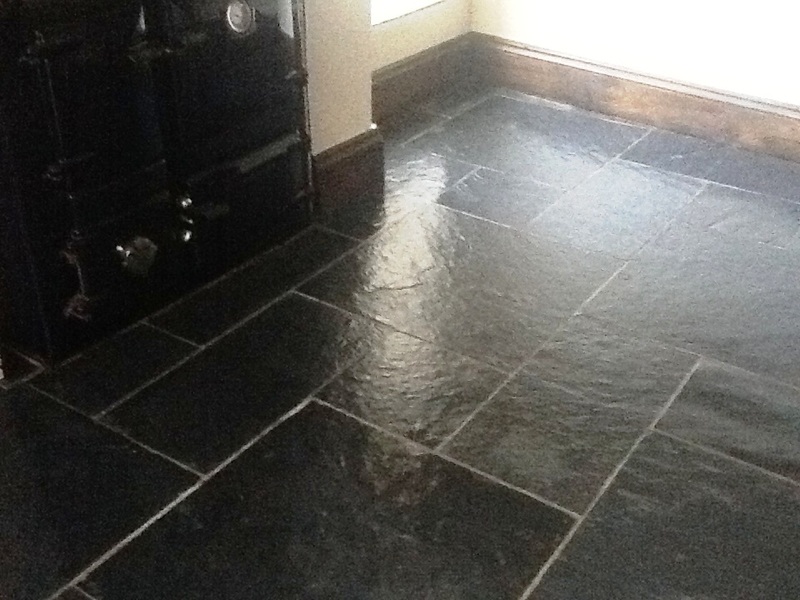 It took five coats before the slate tiles were fully sealed.